This Saturday, July 7th, Grand Island Town Hall will celebrate its 50th birthday as the “new” Town Hall. A birthday bash is planned for Saturday, July 7th at 1:00 p.m. in the upper lobby, with a display of photos, short program and cake! The cupola came from the “old” Town Hall, which was built in 1918 as a two-room school. With the opening of Charlotte Sidway School in 1937, the existing structure became the Grand Island Town Hall. Seema & I were honored to have been commissioned to print the two outdoor banners for this event. A big thank you to June Crawford and Jodi Robinson from the Historical Society for trusting us with this job. The cupola is owned by Kelly’s Country Store. Grandfather Walt Kelly saved it from the wrecking ball in 1968 and moved it to their property on Grand Island Blvd. Also at that location is the #5 one-room school house, believed to have been built in the 1870’s. Thanks to Highway Department employees who moved the cupola in March from a berm at the back of the Kelly property, out to the parking lot. They then made a platform to place the structure on and brought it to Town Hall in June. On Wednesday, June 20th, members of the Kelly family, HPAB (Historic Preservation Advisory Board) and Town officials met to promote the upcoming event. Efforts will begin to restore both the cupola and schoolhouse in the coming months. Watch for the cupola in the July 4th parade! Supervisor McMurray has paid for both banners. Thank you to Isledegrande for this story. 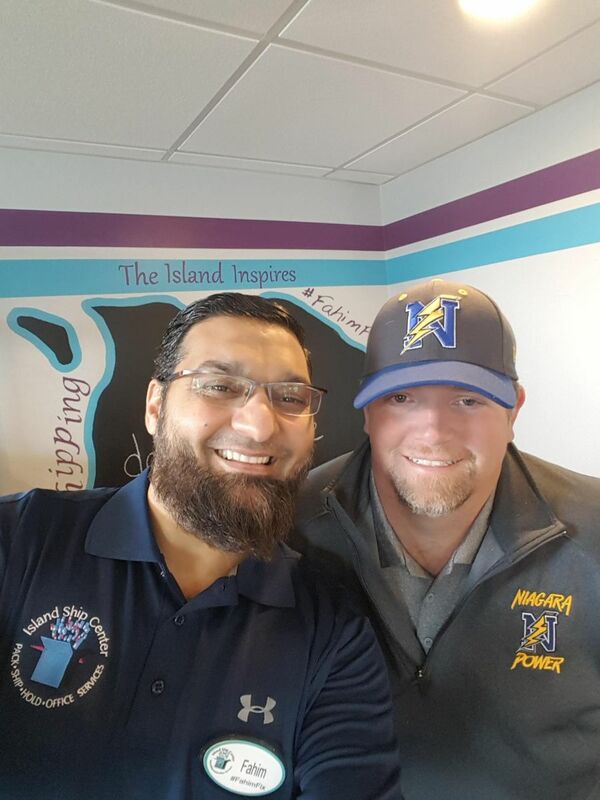 Patrick Tutka, Assistant Professor of Sports Management at Niagara University and the Director of Niagara Power Baseball, is a dear friend and client of ours at Island Ship Center. A soft-spoken, erudite man with an intense desire to build business relationships and make lasting positive impact in the community, Patrick has been recruited from LSU (the epitome of college baseball) to Niagara University and is doing amazing things there. He has an extraordinary ability to lead his students to do great things as well. As director of the Niagara Power baseball team, which is owned and operated by NU, Patrick empowers his students to organize all the facets surrounding the games, including managing concession stands, greeting the guests, arranging vendors, being on schedule, team communications, commitment of key players and much more. Recently, Patrick approached us with a proposal to do some ticket printing for the team, in exchange for a sponsorship. We were delighted and gladly accepted the offer. Before every home game, there is an announcement made about Island Ship Center being the sponsor of the first pitch, and we are truly honored. Here is the schedule for your reference. Be sure to attend a home game this summer, say hello to Patrick for us and take a look at your tickets; they might just say, “Island Ship Center” on the back! This past Saturday, we were especially elated and honored to attend the first home game, which was a tribute to the late, great Doug Smith, a long time announcer, supporter and lover of Niagara Falls baseball, and a Grand Island resident for many years. His dear wife Polly, along with his son and family, attended the ceremony, which took place before the first pitch. It was momentous and truly a remarkable tribute to a remarkable man. It ended with Doug’s voice, announcing one of the plays during his lifetime; it brought tears to everyone’s eyes. What’s more, the press box is now renamed after Doug Smith, so be sure to check it out when you visit Sal Maglie Stadium. As always, thank you for your trust and your support, for allowing us to make a difference in the lives of people in the community. Doug loved what we were trying to accomplish and he would have been proud to see the progress.